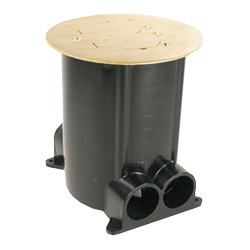 The Walker Ratchet-Pro PVC Floor Box provides dual-service capability in a single, easy-to-install round floor box. This design allows the flexibility of providing power and communications to open-space areas in one aesthetic package. Applications include malls, shopping centers, department stores, airports, hospitals, and office buildings. This box is UL/cUL Listed for both grade and above grade concrete construction. TopGuard protection keeps out water, dirt, and debris from the power or communication compartment. Meets and exceeds the new UL scrub water exclusion requirement. UL Listed to U.S. and Canadian safety standards for tile, terrazzo, and the future UL requirements under UL514A and UL514C for scrub water exclusion test for carpet and wood floors. Ratchet adjusting ring allows for quick and easy installation without gluing, as well as removal of cover to activate at a future date for dual service (Conduits must already be connected). 10° of flexible adjustment allows cover to conform to the surface of the concrete pour, which significantly reduces labor costs. 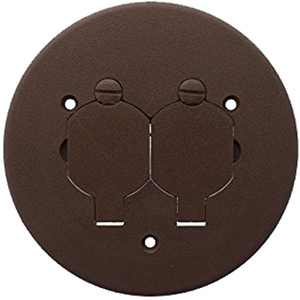 Parallel conduit hubs allows for conduit feeds to be parallel for both power and communication cables. Reduces labor and material costs by eliminating the need for 90° bends and allows for easier wire pulling for dual-service. Graduated cubic inch markings on interior of the box. Corresponding graduated cubic inch markings on divider. Labor savings provided by easy separation of services. Individual compartment capacities are indicated. Four 1" [25mm] conduit hubs. Greater capacity allowed by larger conduit hubs. Individual conduit reducers and conduit plugs. Reduction in labor costs by supplying direct reduction for 1/2" and 3/4" [12.7 and 19.1mm] conduits.Reducers and plugs are separate. Streamlined design of divider. Labor savings from ease of cutting using a utility knife, no hacksaw or tape measure needed. Also allows for more room to splice wires. "Dead-Front" protection with the 897CTC Series and the 881CTC Series Covers. Slide covers snap back into place when receptacle is not in use to prevent dirt and debris from entering device.